Command the most powerful soldiers in the galaxy! Mantic Games, sometimes called the poor man’s Games Workshop but probably more aptly titled the person-with-a-normal-income’s Games Workshop, continue to pillage their inspiration’s back catalogue with this thinly disguised take on Necromunda. That all sounds critical, but it’s not! Games Workshop needs a reasonably-priced competitor, and Necromunda is one of my favourite games, criminally ignored for years by GW—so I’m happy to own Deadzone and I’m glad Mantic made it. There’s nothing original in the way of theme here—it’s The Thing meets Warhammer 40K—but never mind, it’s just an excuse for some good old-fashioned squad-level biffo with some boxy terrain and pretty standard models. Necromunda, despite being released in 1995 (or perhaps because of being released in 1995, considering production costs these days) still holds the crown for the best urban terrain in a game. Deadzone’s modular plastic cube system is fine once you’ve built and painted some structures, but the connector system is fiddly and breakable and no where near as modular and ‘clip-together’ as Mantic advertises. The figures are somewhat uninspired, and the ‘restic’ plastic makes cleanup difficult (and there is a lot of cleanup) and time consuming. The lack of assembly instructions is unforgiveable, as is the way the pictures of the terrain and miniatures on the box don’t match what you get inside. More attention to detail, Mantic. However the mousemat-material play mat is nice. It took a crapload of construction, modelling and painting to get it on the table, and it’s not a job for beginners, so I made a series of videos on the preparation, construction and painting of the Deadzone components, and a two-part battle report video. 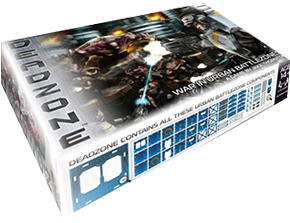 After just a few years Mantic decided it was time to ‘update and improve’ Deadzone, so another Kickstarter campaign later, Deadzone Second Edition has arrived. According to Mantic it is ‘ faster, bloodier and easier to learn’, and while I wish I’d played more games of the original system, after all the time I put into making the original rules summary and reference, simplicity is probably a good thing in this case. First edition was a bit fiddly. Plus, they’ve improved the quality of the original figures by making them in a decent hard plastic this time. owh.. yeah! been waiting for this for a while..
thank you sir! any plans on making rules summary for other mantic games in the likes of dwarf king hold series & project pandora? Not at this stage but you never know! Will your summary include the Nexus Psi content. More rules were tucked in there and most references left them out. Pretty please? One thing at a time my friend, one thing at a time! So stoked that you picked this up! I agree with the non existence of assembly instructions. I went pretty far in with the kickstarter, and after receiving all my stuff, figuring out how to put together the figures took some perusing the internet. And then after getting various different building types (landing pad, fortifications, etc) I had no idea what building sprues went with what. You had to go back through the kickstarter updates to know which ones went with what, and still no examples of how to put stuff together, or what parts did what. I recommend putting a few of the buildings together before priming and painting because having to scrape out paint to make things fit and then breaking a couple of the precious connectors can be a pain. And yes it is no way as modular as they claim. I have already committed to gluing some of the structures together. The system is fun and frantic and should be considered a boardgame since there is no need for a measuring tape, just count your “cubes” and go! Also if you have played Mantic’s other offering (Dreadball) then you should feel quite comfortable here, the system is quite similar in concept except with d8s instead of d6s. Looking forward to seeing your progress! The lack of instructions or help is a serious omission, and is part of the overall lack of attention to detail: the way everything is just thrown in the box and rattles around, the fact that there are no good large clear photos of the completed minis to use as an assembly guide, and especially the fact that there not enough connectors or terrain pieces to build what’s shown on the bottom of the box! I’m building a few small buildings I can use in different configurations, and then I’ll superglue the connectors before priming and painting. They’ll also be easier to paint that way as I can spray grey and white ‘top-down’ to get a simple highlighting effect before detailing. For your Deadzone summary, on pg.9 isn’t Shoot a short action? Having all the rules in one place is a great idea. Just watching your videos now, but evrything looks great. Well done. Argh, terrible slip-up! I’ll fix that immediately, thanks for letting me know. Hi, UH… going to your old stomping grounds wasn’t very good for the health of my wallet. Picked up a Deadzone Starter set plus the Rebs faction and a Mercenary Wrath (to qualify for free shipping). As if I don’t have enough games on my plate… but the guy was giving a nice discount as they were all his last sets and he was having a sale on them. Now need to download and watch all your Deadzone videos! Hi UH, watched your Deadzone videos. The Enforcers truly were a pain to assemble. But I have a question about the scenery: did you wash them first before you sprayed them? I know you washed the minis, but do you need to wash the scenery? I can’t 100% remember, but I don’t think I did. But with all plastics it’s probably worth doing if you’re not in a hurry. Doesn’t do any harm, and may improve the adhesion of paint. Deadzone 2.0 starter arrived yesterday. Bought a rubber battle mat at the UK Expo to replace the paper one supplied and ordered another set of Command dice as they only supply 6, which is not enough for two players to have a set each… bit crappy doing that, as a set is needed if either side has an officer and play is alternate activations. Most of the figures and all of the scenery is on sprues and I’m planning to prime the latter, possibly painting it on the sprue, touching up after. It’s pretty bloody annoying the new rulebook is NZD$50, and the dice are $14.99, and now to add insult to injury you need two sets of dice. After supporting their initial campaign and being unimpressed with the quality of the figures, I became disinclined to support anymore of Mantic’s projects and haven’t backed any since. A few years on and I’ve spent ages making these rules summaries, and they’re now doing everything they should have done in the first place – decent rules and proper plastics. Having to pay the cost of a new game to get the updates is frustrating. If you backed the original Kickstarter you should be able to get the v2 pdf for free by contacting Mantic directly. Damn, I just remembered I bought me set after the Kickstarter! I’ll get the new book eventually, but I’m going to wait until the second printing when they’ve ironed out the big list of errors that popped up in the FAQ. I enjoyed Deadzone 1.0 flaws and all. Gave me lots of cinematic moments. While my 2.0 has come in, I haven’t touched anything yet. Too many other games to play. (Just finished the 7 chapter campaign in The Undercity). Those who backed the KS got 2 sets of dice. But yes. Crappy cheesy marketing moves by Mantic that have ensured the Warpath KS is the last I’ll ever back from them again. Those who backed the basic level KS for Deadzone 2.0 were shorted a few terrain parts… after the fact. Mantic’s excuse was: they had to adjust the tooling and the other half of a set of pipes was dropped from the sprue. They claim they can’t provide the extra sprue to backers so we’ll get a complete pipe (instead of half a pipe). Their “generous” move: we pay extra to get what we should’ve gotten… PLUS shipping. At which point I basically washed my hands of Mantic KS. Every single KS , they have gone back on their word and shorted their backers of something since Dungeon Saga. Added: selling a set of 2.0 rules with only 1 set of dice (when 2 sets are needed) is typical of Mantic nowadays. Ironic when you think the founder(s) left GW because they didn’t agree with some of what GW was doing. Now it seems Mantic is trying to out-GW GW. Warpath looks like it requires a lot of space and miniatures. Didn’t know about it until saw advert in Deadzone rules. Never backed a Mantic kickstarter, so not sure what they’re like. I own Dungeon Saga. Again it was not a kickstarter, so not sure what they short changed people on with that. Mantic pricing policy is stupid too. I was at UK Expo and wanted rubber battle mat for Deadzone plus Infernal Crypts for Dungeon Saga. I bought both items from retailers who were selling cheaper than Mantic, which makes no sense to me. Surely the ones that make it can sell it cheaper than stores. And I bought Deadzone 2.0 for £5 cheaper than Mantic website with free delivery. Dungeon Saga backers were shorted some campaigns that were reached through stretch goals. After the fact, when everything was printed and sent to backers, and backers asked what happened to those SG scenarios, Mantic said “Oh, it was an error in the KS graphics”. With no informing backers any time prior to delivery. Then some SG scenarios (promised as printed booklets) got changed to online PDFs. Again without informing backers. Then the notorious Adventurers Companion was riddled with enough errors that Mantic had to do an emergency reprint before they could release it for retail. What did backers get? We got it for free but had to pay a shipping fee… That worked out to an average of £15. Now this nonsense with the pipes for Deadzone : Infestation. Again, shown in the KS graphics (they weren’t even SG’s but what each backer would actually get). Then they claimed they had to change the tooling and 2 crucial pieces were dropped. So now you have to buy TWO spruces to get ONE complete, round pipe. They knew this before shipping to backers ever started… And only came clean when backers started asking questions. Their response: we can’t afford to give you that extra spruce… But you can buy it at a special KS backer price… Plus shipping! Left a bitter taste in my mouth. I think many backers will now back the next Mantic KS at £1 if only to warn potential backers about Mantic’s Antics. But Mantic pricing is understandable. Many games publishers do the same: they CANNOT undercut their retailers by selling at the same or lower price. To do so will instantly turn retailers against them. Had this explained a couple of times to me when I tried to buy some games online direct from the game publishers. Guess I won’t back Mantic… wait for retail instead. So the retail Adventurers Companion is fixed? I have it, but not used it yet… only just finished painting last week. Adventurer’s Companion: all the glaring errors are fixed. YMMV whether the contents in the Companion actually lives up to what was promised during the KS or not. Retail pricing: to the extent the owner of my FLGS confirmed it…. It’s true. Whether or not that’s the REAL reason… who knows? @UH: any interest in updating your summary to v.2.0? The rules are available for free on the Mantic web site. I thought there were only the starter rules available for download? You know, after seeing the huge errata, I’m thinking of waiting for the second print of the book! Full rules but only 2 factions available. But yes, the amount of errata is embarrassing but sadly par for the course for Mantic nowadays. It was the same with the Dungeon Saga Adventurers Compendium. Mantic may be enthusiastic gamers but I wish they would choose professionalism over enthusiasm. This just makes them look like amateurs. While I’m thankful I do have access to all the updated PDFs, I feel frustrated that I have 2 hardcover books that are basically useless. Incredibly annoying website too, finding the rules was a chore. Look, your work is amazing! I just bought the Deadzone 2.0 and found out all the problems you mentioned, but most of all, I found a problem that really annoyed me… The lack of reference cards for the miniatures!!! I mean, they really want me to keep checking the stats of the miniatures all over the course of the game? Really?? And furthermore, even their pdf manual is charged to be downloaded on their site… I mean, I, who bought a phisical copy of the game (and rather expensive, considering the quality of the material), have to purchase the same manual that I already have to own a digital version! So, anyway, my question is… Are you planning on making a miniatures reference sheet or something like that? Could you please, make one? Pretty please??? Yes, the lack of unit cards really annoys me too. I sat down to play this the other day and gave up when I discovered I had to write faction lists. I thought the whole idea behind the new version was to speed up play, not slow it down. To be honest, I think I’ve spent far more time on the game than the amount of time I’ve spent playing it deserves, so I don’t think I’ll be making any unit reference sheets. Looks like Deadzone wants to emulate games like Infinity etc. where you need to build your army with dozens of options, hence the no cards thing. But Mantic also hasn’t come up with an army builder app to simplify tasks like this. That’s why I still haven’t played Deadzone 2.0 yet despite the vastly better sculpts. I haven’t played because been busy assembling and painting other stuff, so hadn’t noticed the lack of cards. No files of BGG either except UK 2.0 reference. There are some good DZ v2 army builders out there, give it a chance! Version two is vastly improved over v1 – every game of the latter ended with a screaming stress headache over all the nutty fiddlyness of it all! I like http://dzone.mentemeccanica.com/, even though the interface is a bit clunky, it makes a nicer pdf that alternatives i’ve found. Thanks matt, I’ll definitely give it a go, and cheers for the link. It would be nice to have an updated reference with the new Abilities and Items from Deadzone: Outbreak. I think I’ve done all I’m going to do on Deadzone, I’m sorry to say (unless for some reason in the future I get back into it) … but thanks for those useful links!